My kids, and especially my girls, are fans of Japanese animation (Anime), and we share a love and an interest in a number of titles. Back in 2011, one of the more inventive and unique titles to make its way to the television and streaming sites was Puella Magi Madoka Magica. In it, a group of “Magical Girls” does battle with witches, and they make discoveries along the way that have tremendous consequences to themselves and others. The “Magical Girl” is a trope that has been used in Anime for several decades. This story stands the tradition on its head. 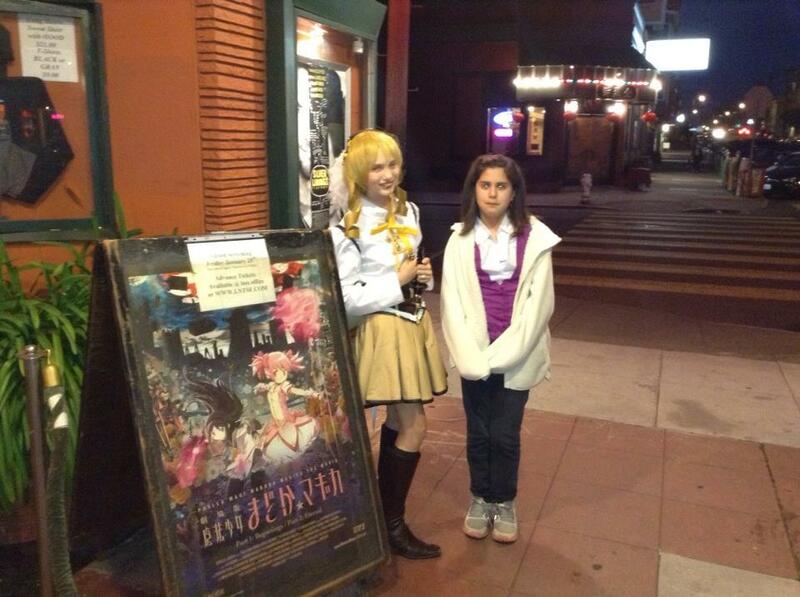 My youngest child really grew to love this series, so much so that she decided she wanted to make a Cosplay outfit based on one of the characters, Mami Tomoe. So she had it made, wore it, and I figured that would be the end of it. Well, not quite. The creators and distributors of Puella Magi Madoka Magica has taken the twelve episode Anime series and have made two movies that they are showing at independent movie houses all around the U.S. and in other countries. This was a chance to see the story in a “director’s cut” of sorts, and one that ran for four hours over both films. As a birthday present for my youngest daughter, I decided to spring for it and go see the movies. She invited her good friend… and insisted that she go in her Mami Tomoe costume. Well, people didn’t laugh, other than to say how cute her costume was. People in line came by and complimented her on her outfit, and her being so young and so brave to get into the spirit of the movie. A number of girls walked by and shouted “Mami!! !”, and some said “Oh, I want to do a costume like that someday!” Lots of people asked before the movie, during intermission and afterwards if they could get a picture with her. She smiled and said “Sure!” and was very gracious with all the requests. Why do I mention this? It struck me that sometimes we deny ourselves the opportunities to do things because we fear other people’s reactions. Often it comes down to “People Will Laugh At Me”. My daughter reminded me last night that, yes, sometimes we do things that might get laughs, and sometimes people who don’t appreciate what we do will look at us funny and yes, they may even laugh. Her answer, though, was “So what? I’m not doing this for them. I’m doing this for me, and for those who will appreciate it for what it is”. I’m proud of her, and for the fact that she had such a great experience, and was willing to do what she wanted to do and not be afraid of what other people might think.